When I first got to practice, word on the street was that Dallas Stars 2018 first round pick Ty Dellandrea would be waiting until Friday to make his pro debut. Before the zamboni hit the ice, Dellandrea's plans had changed. Tonight will mark his first pro game as he will center for Texas against Grand Rapids. Initially, Texas was holding out Dellandrea after he went hard into the boards on Sunday in his final game with Flint. "I’m feeling good," he told 100 Degree Hockey today. "I was a little banged up in the last game, but I got a couple days to rest and I’m feeling good now." The young center is excited to get started in Texas. 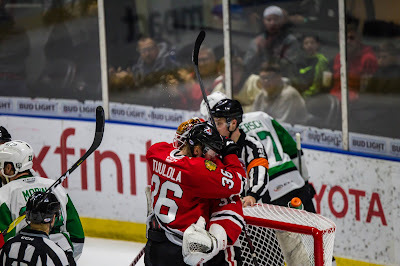 After playing for a club that was virtually eliminated from the playoffs months ago, Dellandrea noted he is "excited to play some fun, competitive, high-end hockey." He's already gelling with the guys, many of whom he knows from camp, "I think I first noticed that it was a fun group of guys. They’re all laughing, enjoying each other and having a good time. It’s fun to come in and they made it easy to feel welcome. It’s fun to learn from them already." As to what he will bring, he adds, "I’m an all-around forward. I take care of my own end first, make sure all those boxes are checked, and then I can bring some offense too." The lineup that we saw at practice did not include Dellandrea so things will shift based on his insertion. However, Rhett Gardner, Josh Melnick and Joe Cecconi will all play. As of this morning, Melnick was set to center Denis Gurianov and Colin Markison while Gardner would center the third line. Things might shuffle around with Dellandrea at center now. Cecconi will slide in next to Ben Gleason, which really fits his mold from college where he played opposite offensive phenom Quinn Hughes. Coach Laxdal added, "Cecconi has played with some real offensive defensemen so he has a pedigree of being a shutdown guy and defending for those offensive guys, so we put him with Gleason." As to how these players will integrate, Coach Laxdal is just looking to keep it simple for them, "We don’t give them too much, just try to give them the basics of how we play and what we want to see. These players are coming off playoff highs of getting eliminated and now they have to change their mindset again to get ready to play. They’ve got to ramp it up a bit, but they’re going to be thrown right in." Without a chance to work on special teams, I don't anticipate a big debut for any of them on the power play. With Thursday's practice, however, it makes sense that Gardner could be a netfront player on the PP on Friday and Dellandrea would be added to the unit as well. The final playoff spot in the Central division is completely up for grabs with four teams scratching and clawing on a daily basis to secure it. 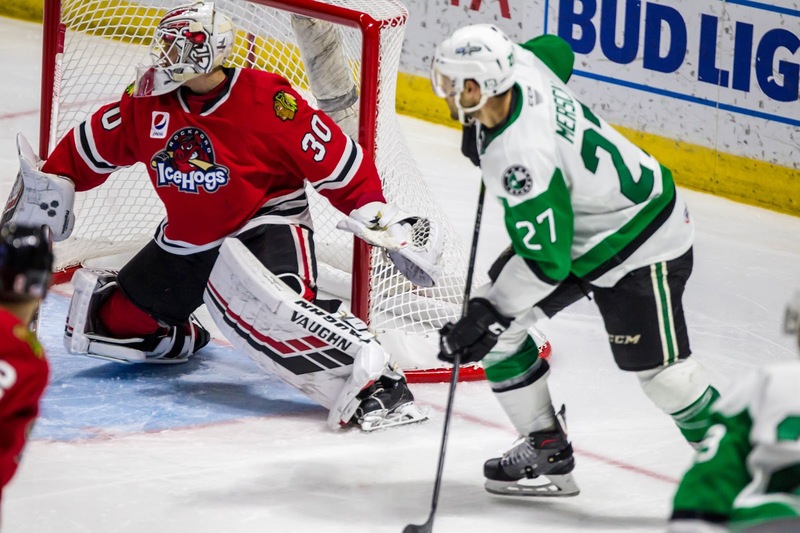 Two of those teams, the Texas Stars and Rockford IceHogs, square off on Sunday in a matinee. The Stars are catching the IceHogs at a good time. Rockford will be playing their third game in as many days, but both of their previous games were wins against Grand Rapids and Cleveland. They are currently one point behind the Stars and have a game in hand. The Stars need to take advantage of some tired legs. 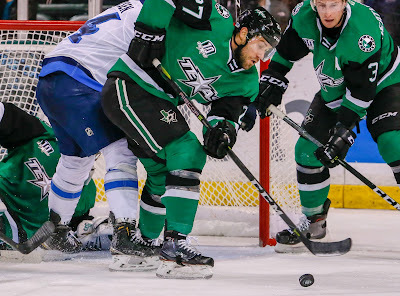 After Friday's overtime win in Manitoba, the Stars clearly needed a breather as they gave up three goals in the third period and narrowly escaped with the victory. The day off on Saturday could be a huge factor against the IceHogs. 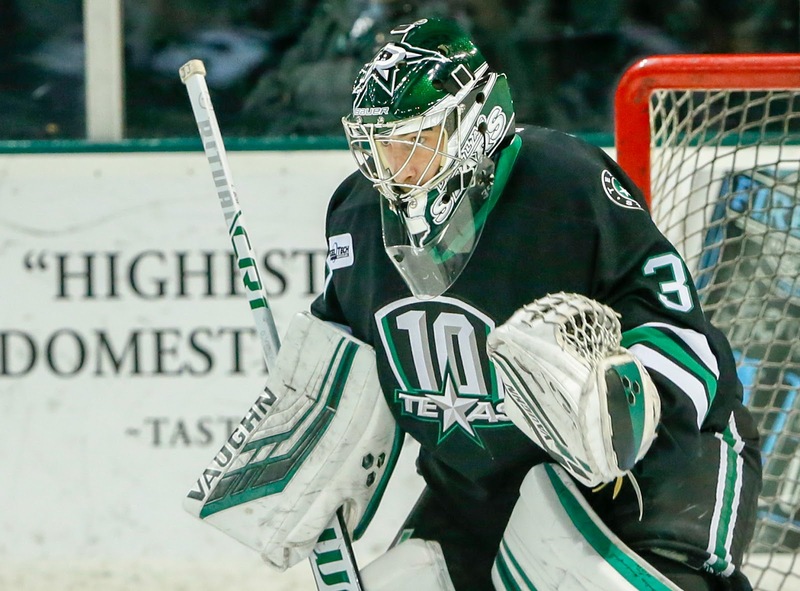 Phil Desrosiers figures to get all the starts in net while Landon Bow is up in Dallas. To fill in behind him, the Stars brought up Colton Point on Saturday from the Idaho Steelheads. It would be tough to ask Point to step in during this critical stretch, though it could pay dividends in his development. Though the Manitoba Moose surged back to tie the game in the third period, the Texas Stars came away with two points in the standings on Friday in a 5-4 overtime win in Winnipeg. 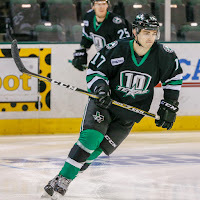 Forward Michael Mersch scored the game winner in a critical contest to keep the Stars in the last playoff spot in the Central division. The optics weren’t great considering the Stars had a three-goal lead headed into the third period. 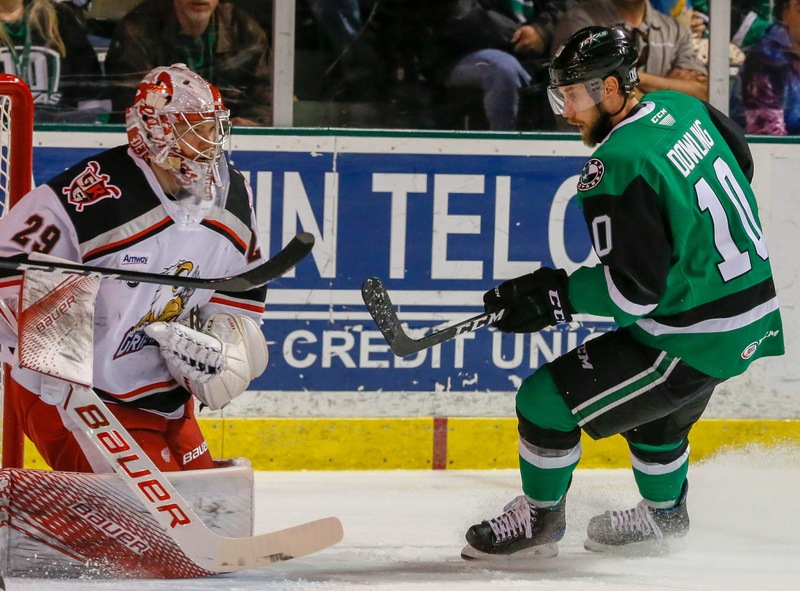 The Moose completely outplayed Texas in the final frame and took advantage of some tired Texas Stars, scoring three straight goals. 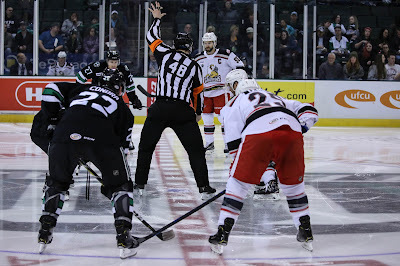 But, as head coach Derek Laxdal likes to say, the Stars will take the two points and move on. Style points are of far less value than standings points after all. 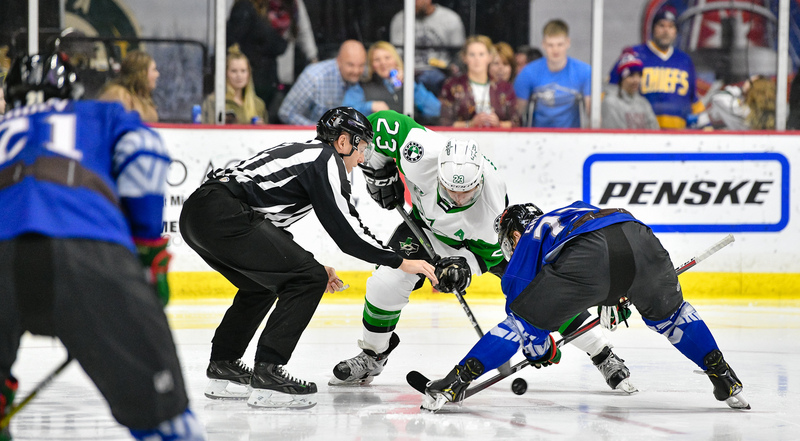 The first period was the polar opposite of the third for the Stars as they came roaring out of the gates. Travis Morin opened the scoring nearly nine minutes in, finishing a beautiful tic-tac-toe play initiated by Justin Dowling. Dowling’s perfect pass found its way to Condra then to Morin for the redirect. It was Morin’s eighth goal of the season in what has been a down year in the goal-scoring department. Tony Calderone scored a weird one six minutes later when a puck bounced off of his leg and in on a set-up by Colin Markison. 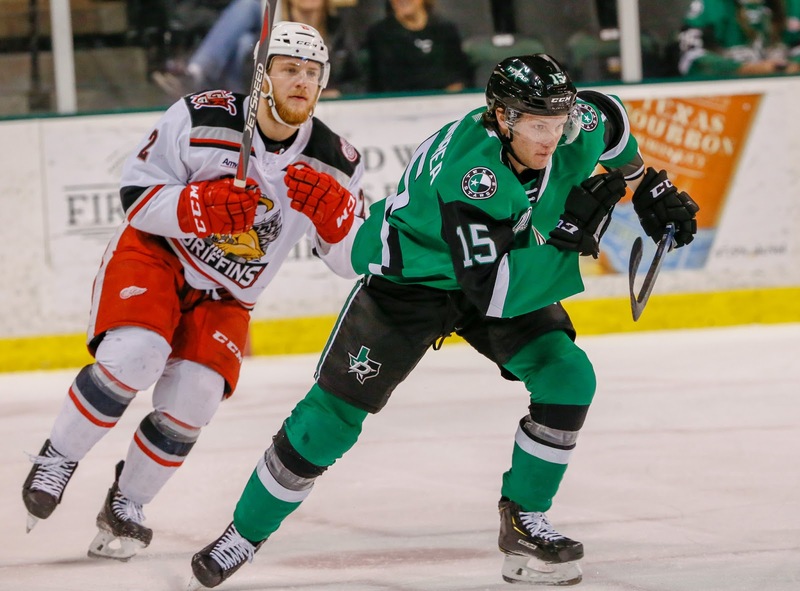 With less than a minute and a half remaining in the opening frame, Erik Condra came up with a shorthanded goal, the second of the season for the Stars. The other shorty was scored by Colton Hargrove in the season-opener. One key factor that gave Manitoba life after they went down by three was that the Stars couldn’t stay out of the penalty box. Texas went to the penalty kill six times and only killed off four. The first goal they allowed from Logan Shaw on a pretty one timer with just under five and half minutes remaining in the second period. Denis Gurianov would answer four minutes later to restore the three-goal lead. 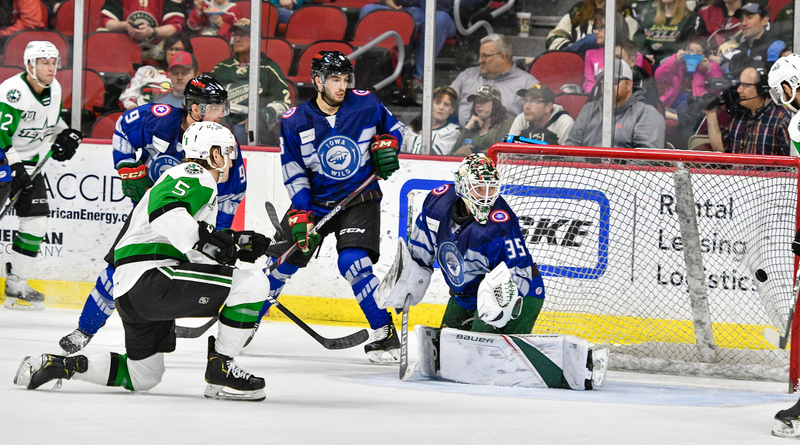 Goals from Mason Appleton, Marko Dano, and Jimmy Oligny capped the Moose comeback in a third period in which Manitoba completely controlled play. They ended up outshooting the Stars 22-8 in the frame. 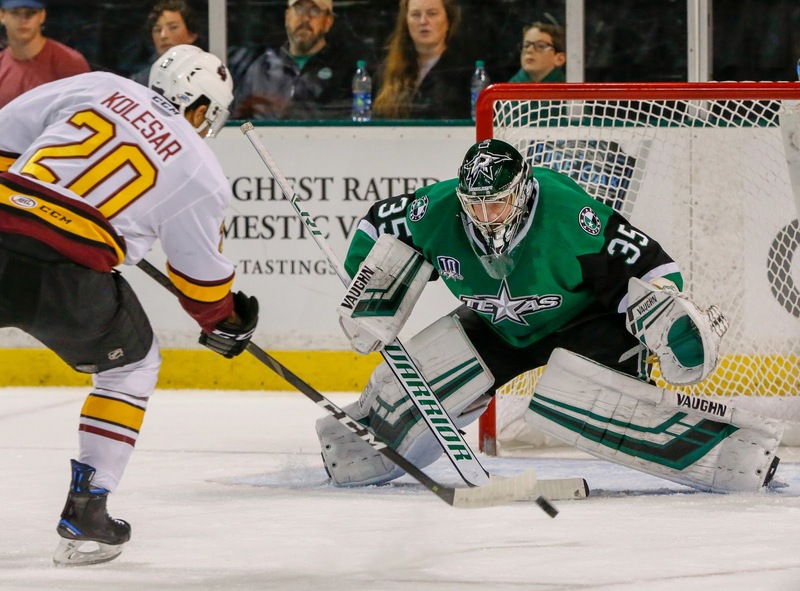 Phil Desrosiers got the start in net for the recalled Landon Bow and finished with 38 saves on 42 shots. 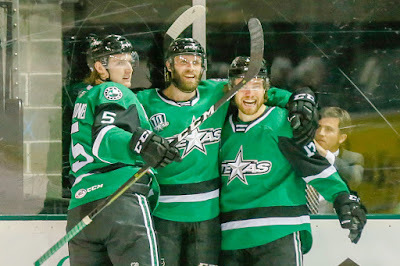 With two and a half minutes remaining in regulation, the Stars had to kill off a huge penalty and ended up drawing one of their own to close out the period. 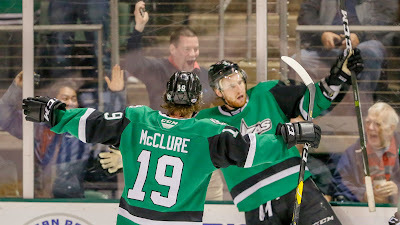 With a healthy amount of 4-on-3 time in the overtime frame, the Stars seized momentum. Mersch put the finishing touches on the victory with his nineteenth goal of the season. The Stars will swing through Rockford for a 4:00 PM contest on Sunday before heading back to Cedar Park. 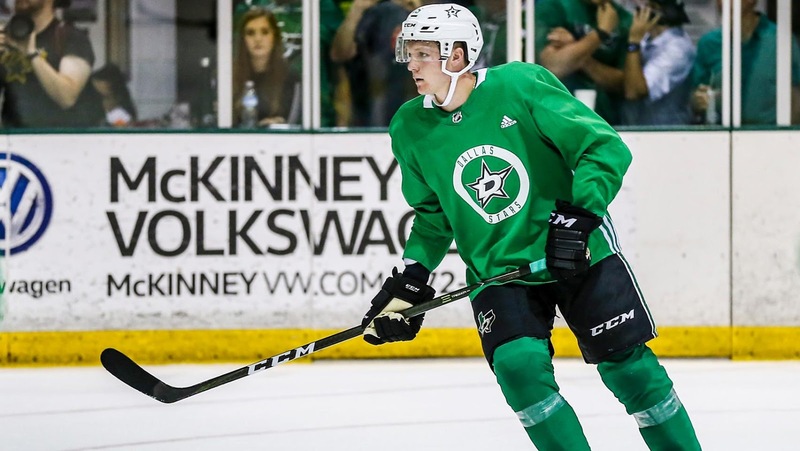 Update: Landon Bow was recalled to the Dallas Stars on Friday morning. The club has signed ATO Byron Spriggs as emergency backup for Philippe Desrosiers tonight. 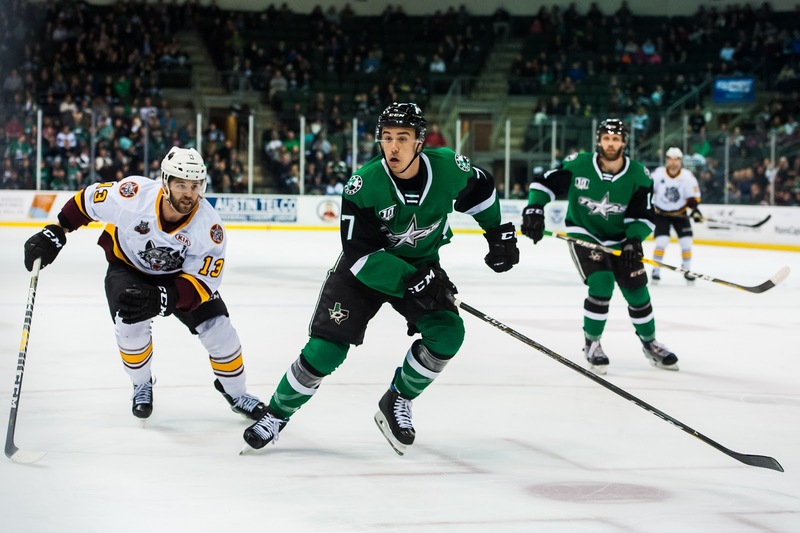 The heat is on for the Texas Stars after losing the first of a pair against Manitoba on Wednesday, a game in which the hockey gods spotted them some generous puck luck. 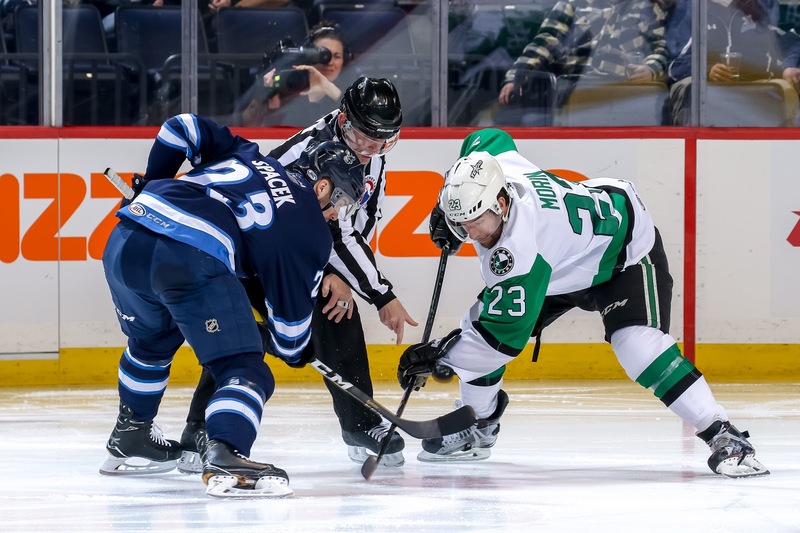 The opportunity to put the Moose in the rear view mirror in non-existent at the moment as the Stars will only be able to keep them at bay with a win. A loss would mean that the Moose leap-frogged them in the standings with two games in hand. The good news for the Stars right now is that they still maintain a modicum of control over the standings while holding onto the fourth and final playoff spot in the Central. Also, they are getting some great production from their blue line with both Joel Hanley and Gavin Bayreuther picking up goals in Wednesday's game. This was after a three-point performance by Niklas Hansson in Cedar Park last Sunday. Head coach Derek Laxdal spoke on the importance of getting scoring from the defense corps on Sunday: "It just kind of compliments the whole group. You’ve got [Ben] Gleason, you’ve got Bayreuther. Now if [Hanley] can start jumping in that group and providing some offense, it’s only going to help us down the stretch. We run Gleason [on the second power play unit] with Hansson, and you saw what Hansson’s done this last couple of games on the power play." 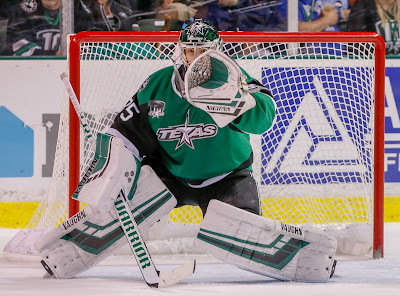 In other news, Dallas Stars goaltender Ben Bishop Thursday's game against the Minnesota Wild in the second period with an injury. He did not return and is currently considered day-to-day. Chances are pretty good that Landon Bow will be one of the NHL club's emergency recalls within the coming hours. With the loss, Texas loses some ground in the playoff race. They retain fourth place but lose a game-in-hand against their next closest trailer in Milwaukee, who beat Cleveland tonight. Manitoba jumped to 6th in the division with the two points and now trail the Stars by just two points for the last playoff spot. Erik Condra had the best chance of a scoreless first period, ringing one off the post on the power play. The quiet first gave way to a busy second period. 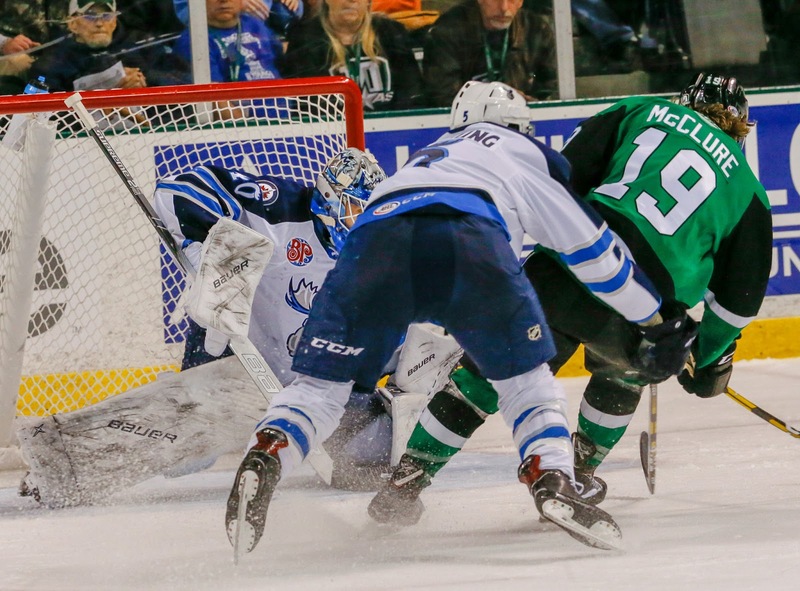 Cam Maclise and Brad McClure traded goals early in the frame. McClure's tip came off the point shot of Ben Gleason, who got it from Adam Mascherin in the aforementioned left-wing corner Twilight Zone. It looked like Manitoba would achieve the clear, but the bounce to Mascherin allowed the scoring chance and goal. Joel Hanley's center ice dump-in goal was next up as a deflection and rolling puck confounded Eric Comrie for the 2-1 lead. Manitoba answered back twice. Marko Dano tipped a power play marker past Landon Bow to tie things. Then, with twelve seconds left in the period, Cameron Schilling had an open net off the pass from Jimmy Oligny. The net was open as Landon Bow lost his footing and his stick on the preceding play, giving a full 6x4 cage for Schilling's target practice. After getting some good zone time on the power play in the third, Texas cashed in with Gavin Bayreuther's fifth of the year, a slick pass from Condra to the defenseman sneaking down from the point. It wouldn't last long as the Moose reclaimed the lead off a rebound goal late in the period. 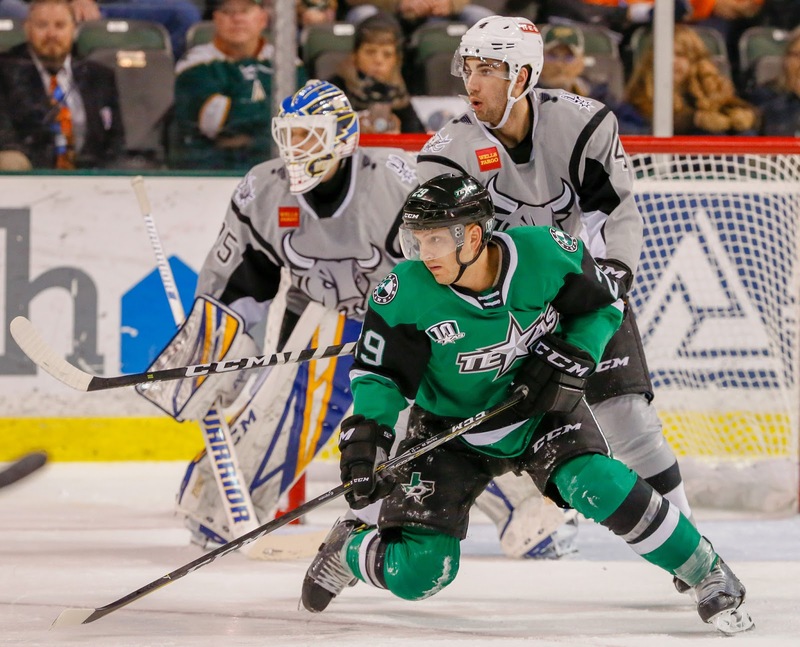 The Stars took a questionable penalty to kill any momentum that they might have built late in the period. Erik Condra hit the post during the 6-on-5, but that was the closest they would get. 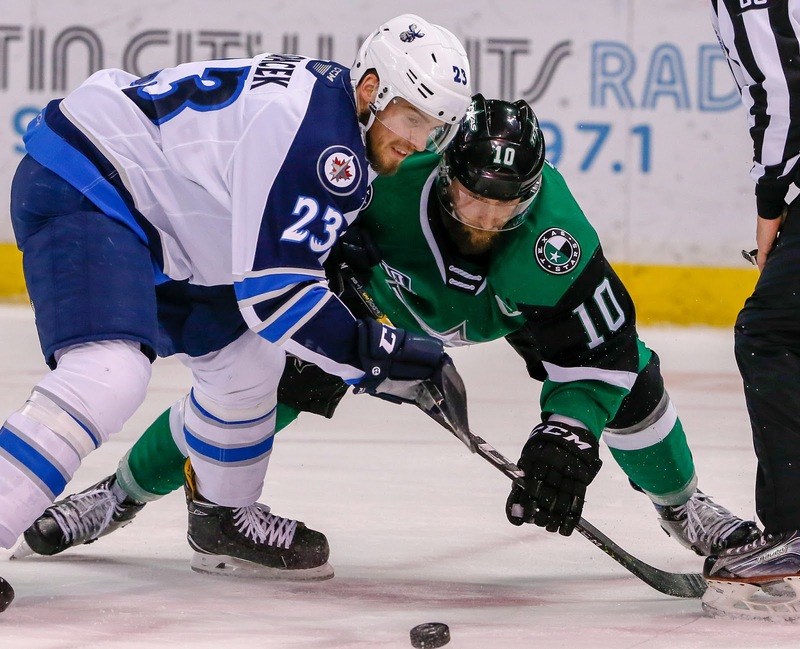 Texas stays in Winnipeg to play Manitoba again on Friday night. There are no AHL games on the schedule tomorrow night, so there's no scoreboard watching to do in the playoff race. Four huge points this past weekend against San Antonio put distance between Texas and the rest of the field in the divisional playoff race. The final visit of the season to Manitoba will provide an opportunity for more distance. "We try to move up in the standings," said Coach Laxdal after Sunday's win as to what the next month brings. "If you look at our division, there’s three teams that have pretty much run away and they’re probably going to get in. It’s four teams battling for that last spot." The players echo the sentiment with Nick Caamano added, "It’s crunch time. We’re even with a bunch of teams. Every game matters, and when we go on the road, those are big points for us. We can’t really take those games off, and I think it’s huge for us." Texas heads to Winnipeg as the Moose are winners in their last two as well and 5-5 in their last ten. Their late season surge has put them in the conversation to be the last team into the playoffs. They are four points back of Texas, but they have games in hand on everyone in the race. The gap could close very quickly, so the Stars have to play their best hockey of the year right now. "This is the best time of the year," said Texas defenseman Niklas Hansson. "We’re fighting for a playoff spot right now, and it’s tight in the standings. Every game means something big. I think we have a good feeling [in the dressing room]. We’re just trying to be positive and working hard every day." Texas needs to bank points this week because even coming home next week, it's a brutal slate. 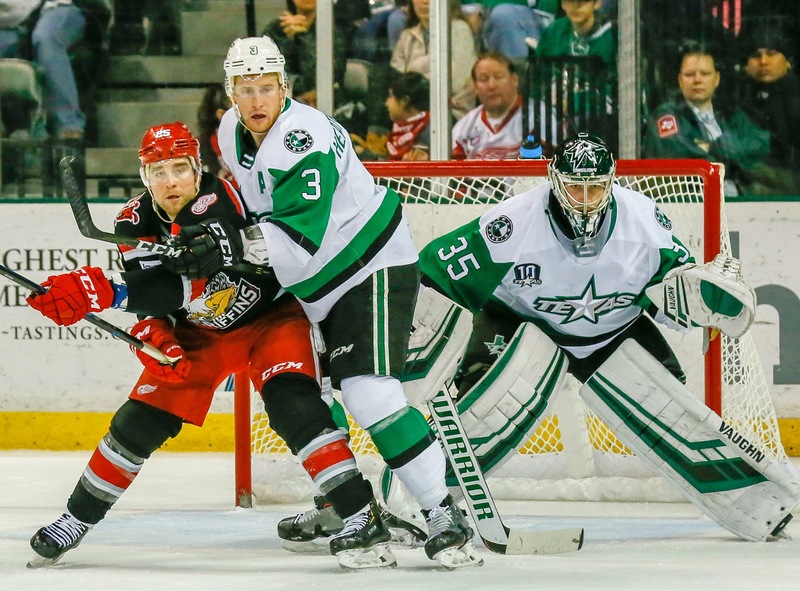 The Stars play in Rockford on Sunday and come home to a pair against second-place Grand Rapids interrupted by another against division-leading Chicago. As a saving grace, after this road trip, Texas will only have three remaining road games, including one in San Antonio, which is just a bus trip away. Eight home games will remain on the schedule. Time to buckle up. The Texas Stars followed up their six-goal game on Saturday with an even better offensive performance in a 7-4 thrashing of the San Antonio Rampage. The victory gives the Stars back-to-back wins in their home-and-home set against their rivals to the south. 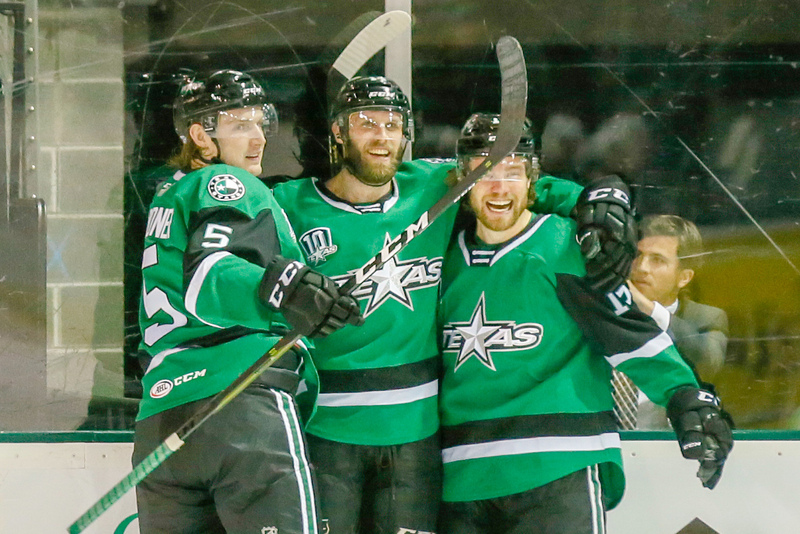 The Stars got depth scoring in spades on Sunday. 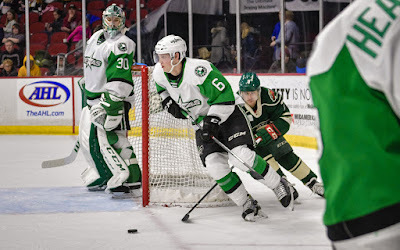 Defenseman Niklas Hansson continued his recent stretch of strong play, leading the Stars in scoring with a goal and two assists to match his output from Saturday. That gives Hansson ten points in his last nine games. Nick Caamano scored an even strength and a power play goal in the first period to give the Stars 2-1 lead at first intermission. The first goal came nine and a half minutes into the game when Caamano cleaned up a loose puck fired from Dillon Heatherington’s stick. The power play goal was the result of hard and fast work by the second unit. Denis Gurianov stepped onto the ice with Caamano and they immediately set up a zone entry with their blazing speed. Caamano deflected Gurianov’s offering from the left circle with just over four minutes left in the frame. The goal was an answer to Rampage center Ryan Olsen’s back door tally two minutes earlier. Fourth liner Colin Markison also pitched in with a goal and a helper. Three minutes into the second period, he got his stick on a bouncing puck and put it past Jared Coreau to push the lead to two. 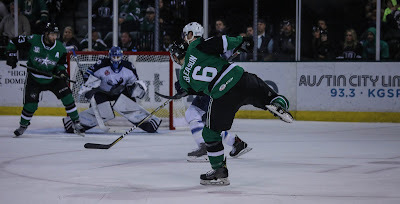 Erik Conda picked a corner on the power play three and a half minutes later to give the Stars even more head room. “We’re starting to play the right way and just getting over pucks, which is creating offense for us,” said Caamano. “I think they’re just starting to go in for us. We had a lot of chances during those games when we had a slump, so it’s nice that they’re going in for us. The scoring cushion would pay dividends later in the frame. With less than eight minutes to go, Gavin Bayreuther turned the puck over on his blue line, leading to another goal from Olsen who went five hole on Landon Bow. Colton Hargrove answered six minutes later as he wired a one timer through traffic, giving the Stars a 5-2 lead at second intermission. 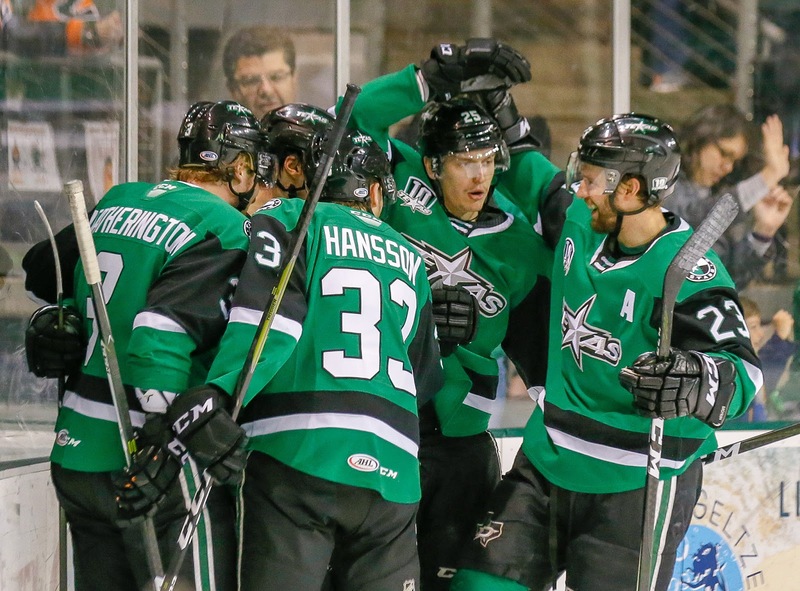 The Stars scored twice more in the third period to put up the seven spot. Defenseman Joel Hanley fired a prayer from the point that somehow found its way through traffic with just thirty ticks off the clock. Hansson capped his impressive showing seven minutes later when he pinched way down and roofed a slick feed from Tony Calderone. Hansson’s lone blemish in the game came with a minute and a half left in regulation. He missed a defensive assignment on the back check, leading to a goal from Tanner Kaspick, though the game was well in hand. That mistake was a drop in a bucket compared to what Hansson’s been giving his team as of late. 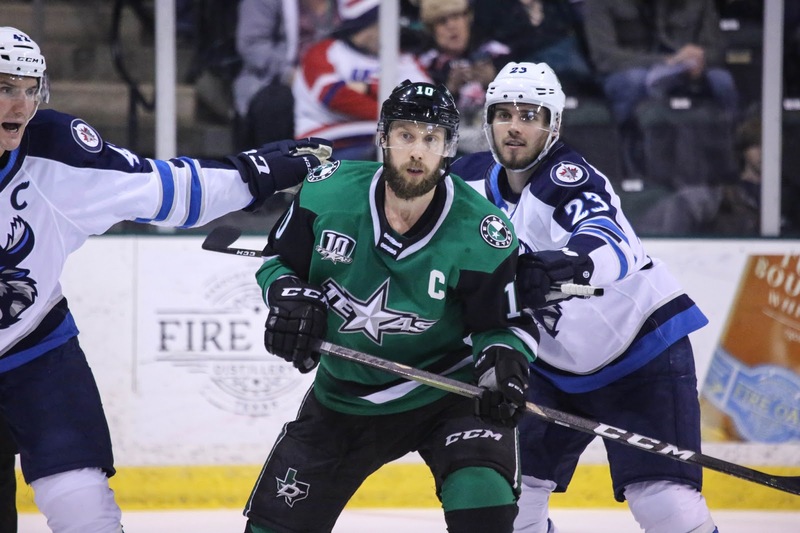 The Stars head to Manitoba to play the Moose on Wednesday. The puck drops at 7:00 PM CDT. Tonight’s attendance was 6,294, along with 84 doggos.